The prize is the full set of images that the DT used in challenge #172.. So that's over $20 worth of images !! 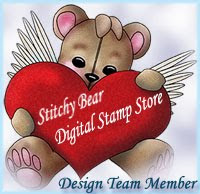 To win our main prize you MUST use an image that's available in StitchyBear Digi Outlet by any of our creators.. Remember to put a # after your name so I can find you easily. Occasionally I catch ones from our store but just in case please add # after your name. You can still enter with a none StitchyBear Digi Outlet image but will be entered into a separate draw to win $3 to spend in our store. Simple finish on the inside. Great rocker card, love the colors and the embellishments. The flowers are sooooo pretty. This is sooo lovely, the Lacey edge of the paper make it so gorgeous. I love every embellishment very beautiful.Thank you for using my image. Beautiful card and love the colours. Great shape of card and love the image. Wasn't this a great image to colour and I love the treatment you've given yours, Nataliya.